This is a re-release of very old Italeri kit, and myy general impression of this kit is that it is a fairly poor model. Italeri gives two Kübels in one box; given the size of the thing, that's a sensible thing to do. Construction is quite simple, given the very low number of parts, but fit is, in general, not very good and the texture of the parts quite rough. Detail (especially for the interior) is undeniably spartan end the ejector marks are in some annoying places, like the inside of the doors. Prominent pins are present on the lower side of the front fenders, but their purpose escapes me. 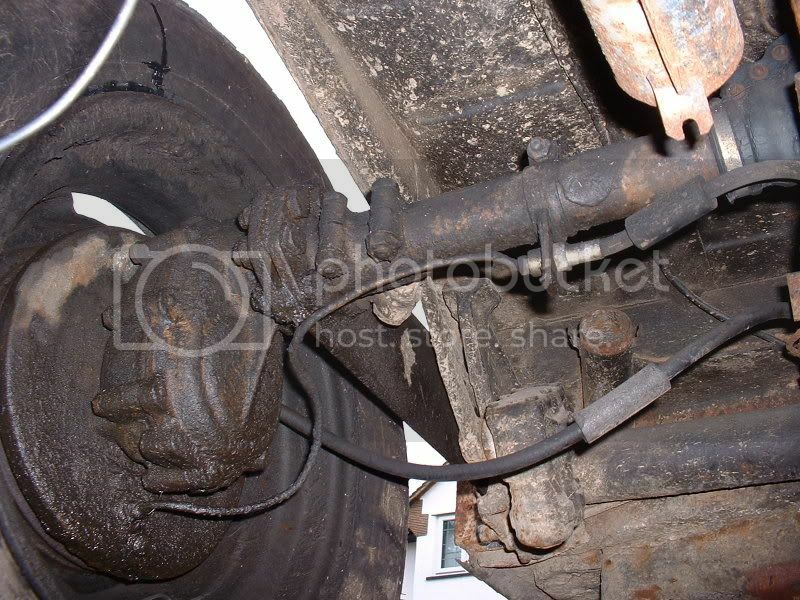 The axles and suspension have been reduced to its simplest form: two rods. The characteristic ribs in the floor and inside of the lateral panels are absent, as are the engine grills and gear shift lever. 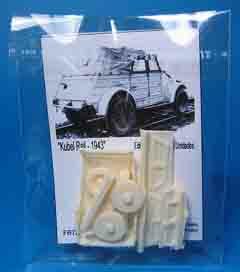 The folded hood is very poor, but the deployed hood is the best of all injection plastic Kübelwagens currently (2010) available. Clear acetate is provided for the windshield, but not for the side windows or the transparency in the hood. Windshield wipers and direction indicators are lacking. The wheels are hollow on the inside. As I was going to build the model with the top closed (otherwise I wouldn't be able to use half of the FBMinis parts), I decided that adding a token impression of the rib details on the doors would suffice. Now that the kit is completed, I am struggling to see even this little bit of detail, which makes me wonder why I bothered in the first place. 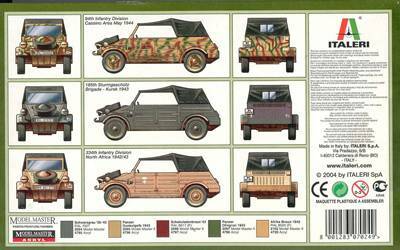 I left off the following parts that come with the Italeri kit: wheels, canvas hood and windshield. The spare wheel was also left off and the mount hollowed out to represent the real thing. - 334th Infantry Division; North Africa 1942/43. "Afrika Braun" overall. 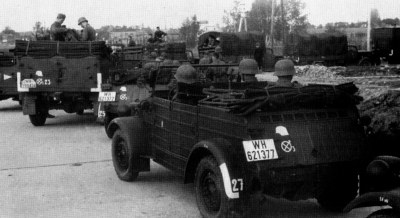 - 2nd Panzer Division; Normandy 1944. 3-color scheme. Incidentally, my decals were damaged by being stuck to the clear acetate that was provided for the windshield. Otherwise, the decals would definitely have been the best part of this kit, if they weren't inaccurate. Timothy Lau points out that the third marking option ("WH 621377" in 334th Infantry Division) is wrong on two accounts. First of all, 334th Infantry Division wasn't part of the DAK, but that's not all. Here is the actual "WH 621377". As can be seen, it was part of another division in another theater and was painted in another color. To add insult to injury, the actual vehicle has the longer fenders of the later type. 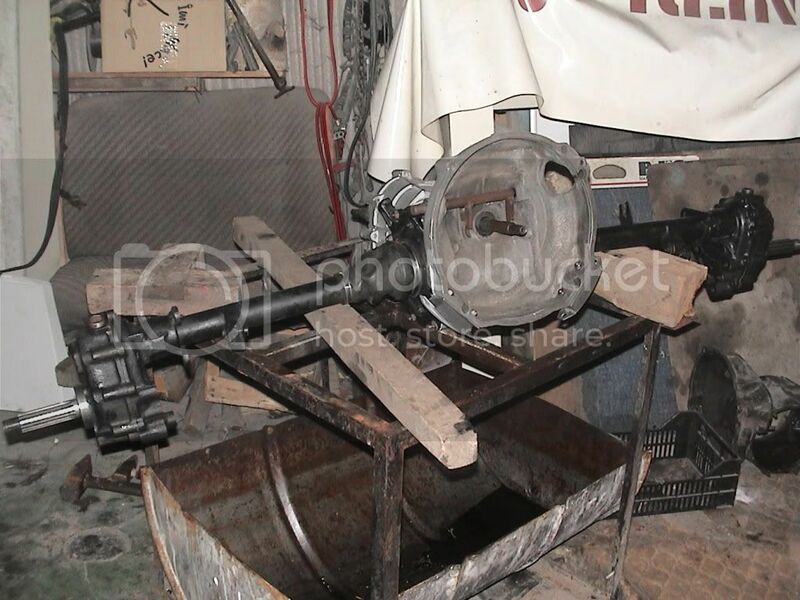 Picture from Henk of Holland used with permission. A scan of the manual of this kit can be found on the Italeri page of the Henk of Holland website. 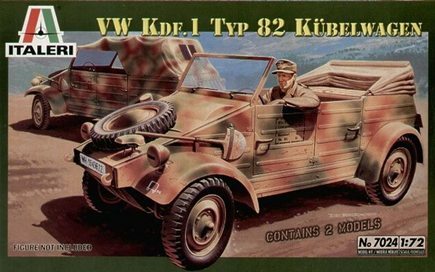 This set is meant as a conversion to transform Italeri's Kübelwagen kit into the rail capable Type 157, which was developed in 1943. 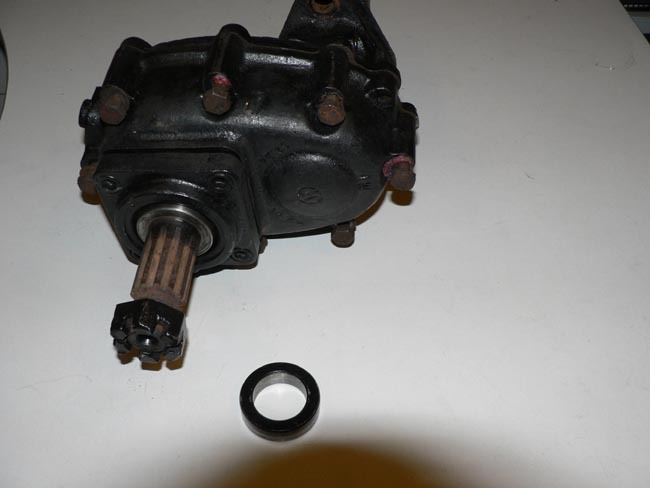 The parts are nicely cast without any air bubbles or other blemishes. (For a preview of this set, click here.) 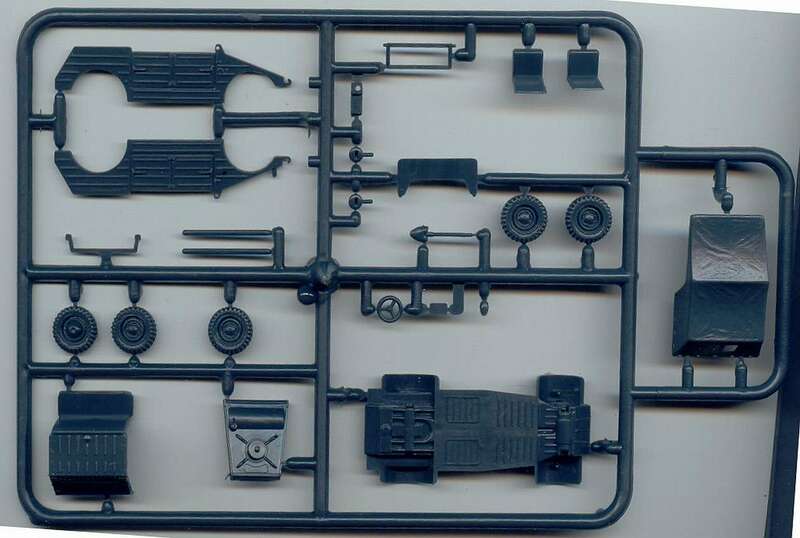 In fact these parts are far superior to the Italeri parts, and it is therefore a real shame that no better base kit was available to use this resin set with. 2. Railroad wheels and bumper. 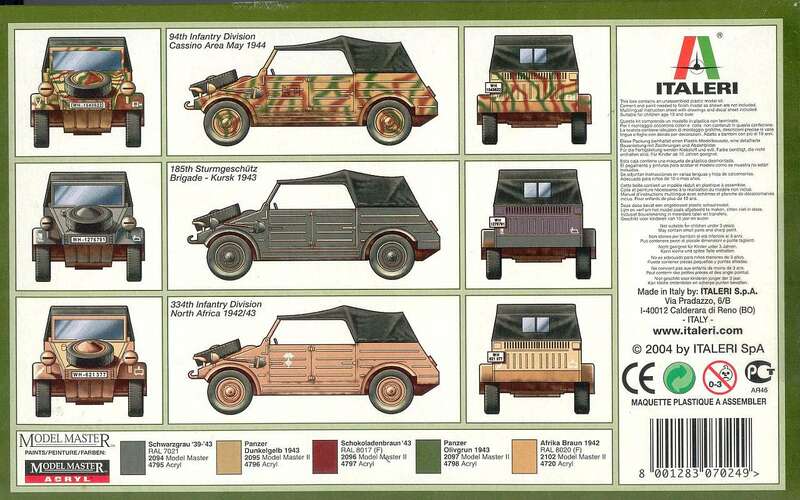 In my opinion you can use both separately, meaning you can use the wheels (and rear "bumper") to make a railway conversion and use the other parts to update another Kübelwagen with a late war canvas hood. As is customary with most resin sets you will have to carefully remove the parts from the backing plate and thin them down. In my set, the windshield was angled too far forward and I noticed some problems with the fit of the lateral windows. The windows were made to fit with careful sanding and some putty. For the windshield I tried heating the part to bend it back into place, but messed up badly, thereby breaking the fragile part into so many pieces that Santa won't come for another two years. After setting the kit aside, ruminating, emptying a bottle of medicinal elderberry wine and popping a sedative, I decided to scratchbuild a new windshield. As it turned out, the end result was not too bad, but the kit part would have been much better. Glass inserts for all five windows were made by carefully cutting out the required shapes from clear acetate. The straps at the rear of the canvas hood (which is a very nice piece, by the way) were sanded off and replaced by short strips of aluminum foil, as I felt these would give a better fit between the hood and the body of the car. The wheels went on without any difficulty. Decals were taken from Aleran sheet GE2. A nice resin set, for a mediocre plastic kit. 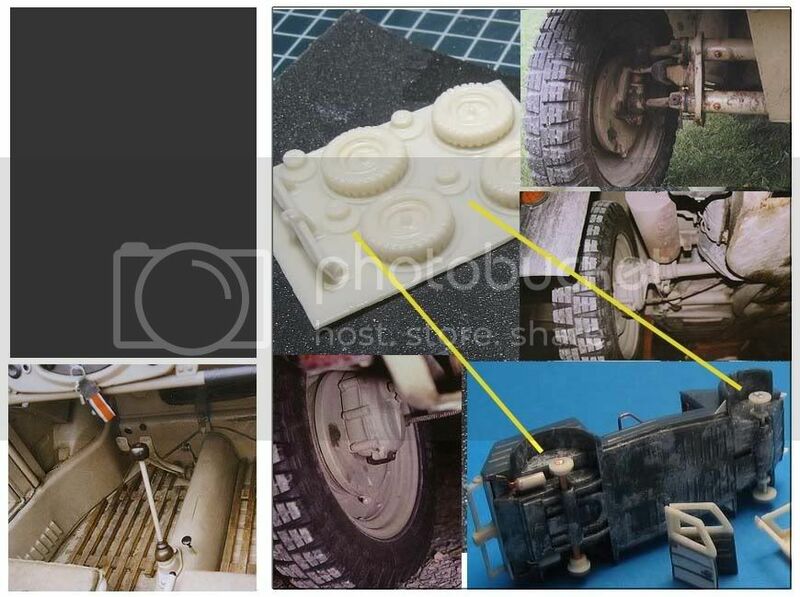 Fortunately, the resin parts hide the interior and replace the poor wheels. Nevertheless, a better base kit would do justice to the FBMinis set.